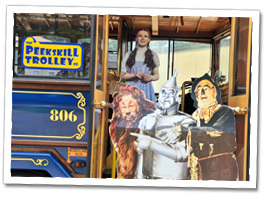 Take a look at the interactive Peekskill Trolley Tour Map. We fell in love with Stella when we first set eyes on her. See the dramatic changes that were made. Click here for more information on our upcoming events, tour info and how to purchase tickets. Please provide your email address to be added to our Mailing List for Events and Specials. Are you looking for things to do or places to go that are fun, interesting and different? Are you looking to rent a unique vehicle for your private function? If you answered yes to either of these questions, then you’ve come to the right place. Trolley cars were the primary mode of transportation in Peekskill, NY and surrounding areas in the early 1900’s. Now our lovingly restored trolley takes you a step back in time so you can experience that quaint pleasure of transport by trolley. So hop on board Stella and for a brief time enjoy that slower, simpler lifestyle. 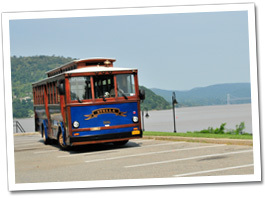 The Peekskill Trolley is here to provide a memorable tour experience or private affair. Stella can take you on various tours, private or public, and she can be the perfect transport vehicle for your special event. Let the Peekskill Trolley help you discover all that Peekskill has to offer; beautiful scenery, rich history, art, music, theatre, fine dining and more. . . .
People stop and stare, children wave and lots of people flip out their phones and take Stella’s picture. No matter what your level of involvement is, we guarantee you’ll get noticed.